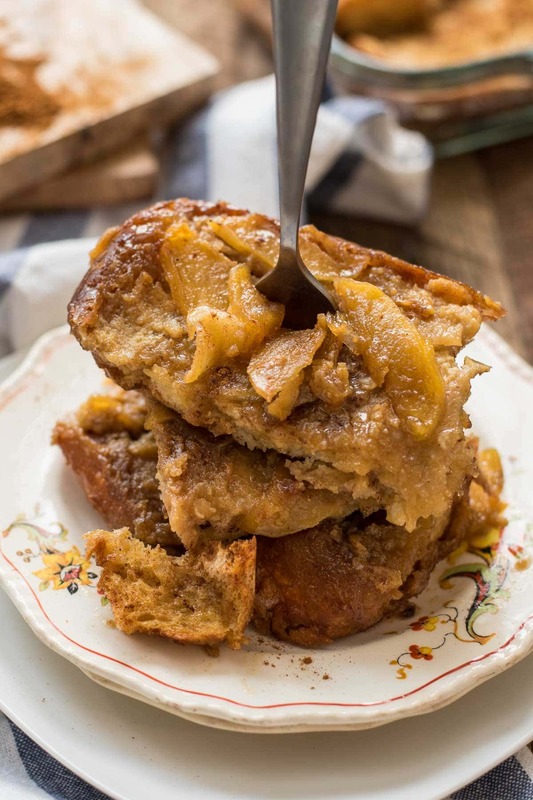 This Overnight Apple French Toast is the cozy breakfast you’ll want to wake up to every Saturday this fall. Many of the recipes on this blog are here because they’re linked to a special moment, place, or person in my life. I love food no matter the day or hour, but I believe much of the pleasure we receive from food comes from where and how and who we enjoy it with. The smell of blackberry peach cobbler baking in the oven transports me back to my childhood, and suddenly I am a little girl sitting anxiously at the table, waiting for dessert to be ready. Fluffy buttermilk biscuits always remind me of Charleston, of brick streets and stately mansions, and sunsets over the water. 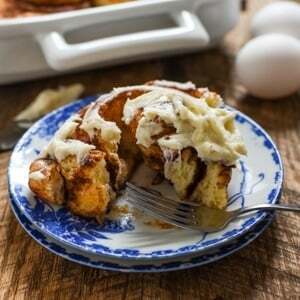 Pull apart of piece of sticky, gooey caramel monkey bread, and I can almost hear the laughter of my friends at our weekly breakfast club. This Overnight Apple French Toast will forever be linked in my mind with my husband and I’s first vacation to Cape Cod. We had only been married for a year when we booked a quaint B&B right in the crook of the Cape. We had never been there before, but we were about to fall in love with the laid back vibe, the cold, crashing Atlantic, and the buckets of mussels we ate at nearly every meal. Our host at the B&B served her guests breakfast every morning on the patio when the weather was nice. She had all kinds of wonderful baked goods to tempt us, but one casserole was particularly memorable. 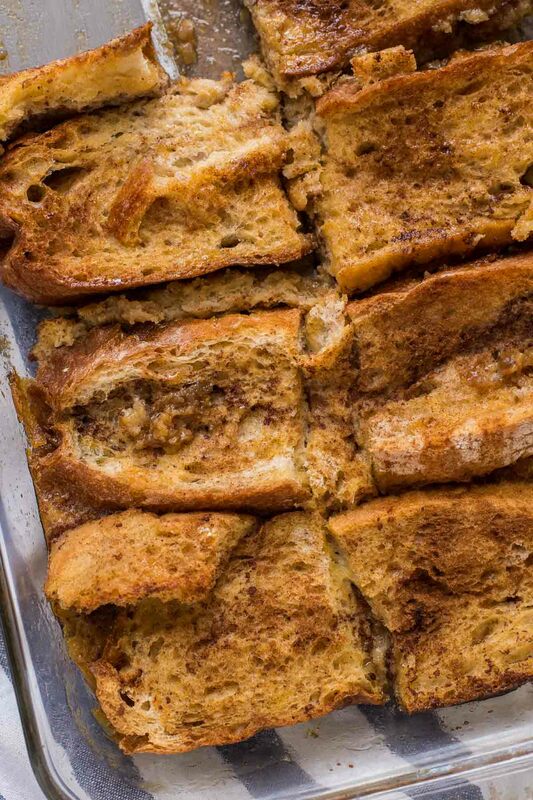 It was a baked French toast with cinnamon spiced bread layered on top of apple slices and a rich, caramely sauce. No syrup required. It was the perfect warm, sweet, cozy way to start a slow vacation morning. Of course, I asked our host for the recipe, and she very kindly obliged. My 22 year old self was thrilled to discover it’s quite easy to make, and since it can be assembled the night before, you can also sleep in and enjoy this in your jammies. I’ve been making it for years now, and it’s a regular when apple season is in full swing. Sometimes I toss a little bourbon into the sauce if I’m feeling feisty, but you can definitely omit it if you prefer. I simply couldn’t wait any longer to share this with you, so I made it in the inferno of mid-July and am sharing it at the very cusp of fall. I figured you would want this goodness in your life sooner rather than later. 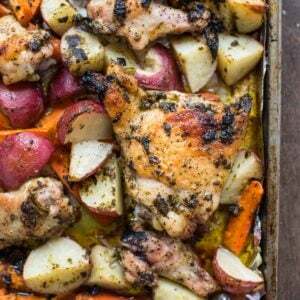 I hope this dish will be wrapped up in fond memories of lazy Saturday mornings with the kids or trips to the apple orchard. Or maybe it will forever be tied to ocean breezes and two kids in love on vacation. 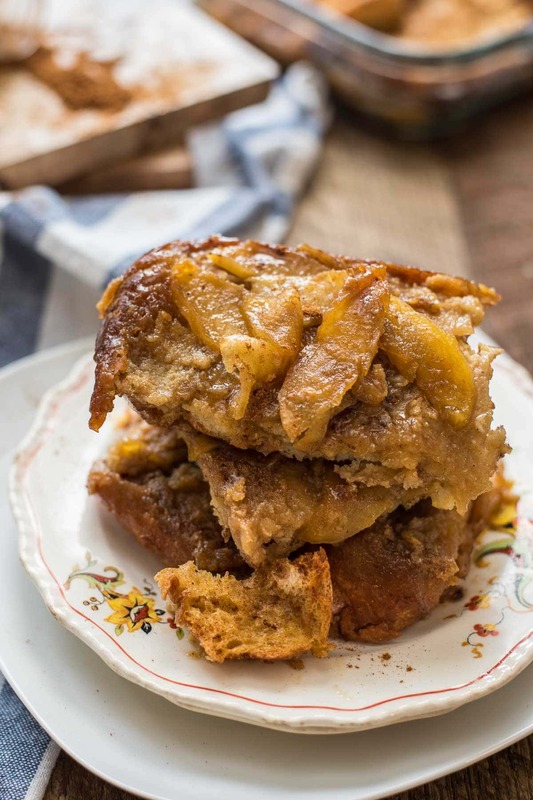 Whatever it is, this Overnight Apple French Toast is sure to make a sweet memory even sweeter. In a small pan melt butter and sugar together. Whisk to combine. Cook until slightly thickened. Add bourbon and whisk again. Continue to cook for about 1 minute. Pour butter mixture into a 9″ x13″ pan. Arrange sliced apples on top. Arrange slices of bread on top of apples. In a large bowl, beat together eggs, milk, vanilla, and cinnamon. Pour mixture over bread. Cover dish and refrigerate over night. In the morning, place casserole dish in oven. Heat to 350 degrees. Bake for 45 minutes to 1 hour, or until apple slices have softened and bread is golden brown. If you are preparing the casserole the morning you are serving it, dip bread slices in egg mixture before putting them in the pan. Pour remaining egg mixture over top of bread slices. Bake at 350 degrees for 40-45 minutes. Thank you for catching that! I will make the change. I hope you enjoyed the french toast! This sweet, decadent breakfast casserole is a must make! I made this recently for a brunch I hosted, and everyone immediately fell in love with the dish. It’s so easy to make, and even easier to eat.